Ok so I should be ashamed to say that even with Indian heritage in my genes, I am totally useless when it comes to making curries! I don’t know where I go wrong, but I have tried hundreds of authentic curry recipes from scratch and it just doesn’t happen for me. They usually come out unbalanced, and powdery?! I surely cannot be the only one with this problem but I am done trying to persist with it for now. Maybe it will come to me one day but in the meantime any curry recipe from me will be based around an already balanced curry powder or a cheat jar of curry sauce. But one thing is for sure – I will choose the most natural healthy jar! At the end of the day we shouldn’t be too hard on ourselves. What’s wrong with having a cheat dinner anyways? Like most people I don’t have the time to be cooking from scratch all of the time as much as I do enjoy it. 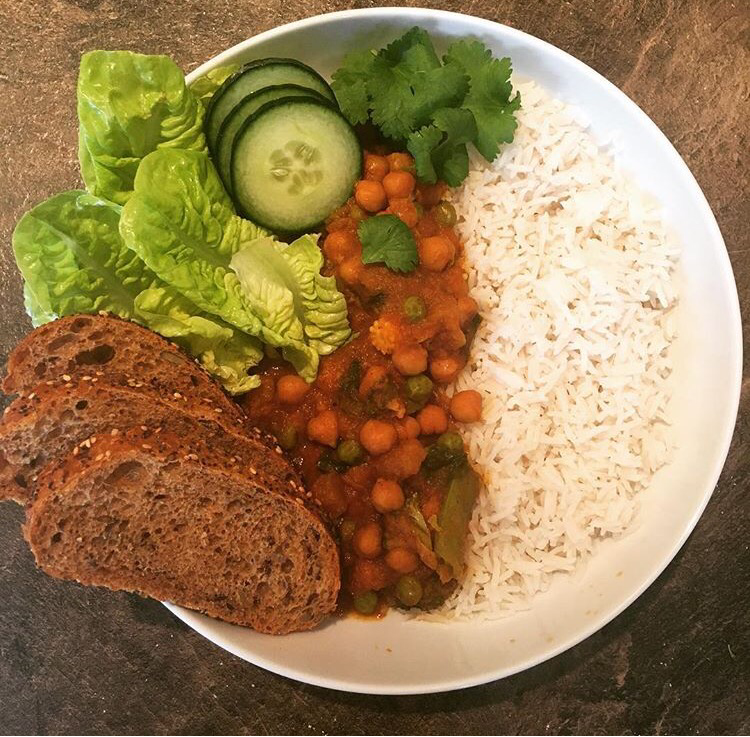 So here’s an example of a delicious, quick, easy and healthy curry without all the fuss……. Sides: I used baby gem lettuce, chopped cucumber, boiled white rice and some sliced brown bread. Heat large pot / frying pan on a medium heat. Add a small amount of water and the chopped veggies. Put the lid on and allow the veggies to soften slightly for a minute or two. Add the chickpeas and the curry sauce. Allow to cook on high heat for ten minutes. Reduce heat, add the coconut milk and simmer for 20 minutes. Taste and season with salt & pepper if necessary. Serve with whatever sides you like.